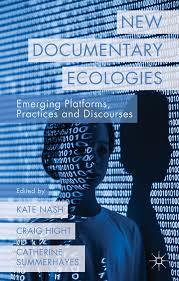 New Digital Ecologies: Emerging Platforms, Practices and Discourses begins with a quotation from Katerina Cizek, a Canadian documentary filmmaker, in which she claims that “[R]eally great documentary is about remaining open to what’s actually happening around you” (1). The superficial meaning of this is clear enough; what emerges when one begins to ask what “remaining open” means in practice, and what is concretely meant by “what’s actually happening around you” is more complex. Unraveling these questions is the focus of this anthology of essays, which explores how the technology and affordances in the digital domain are creating new opportunities for documentary. Taken together, these essays argue for an renewed openness among both documentary filmmakers and film-viewers – frequently identified together as “users” – to new advances in the genre. The book features many of the leading scholars in the field of the digital documentary. Encompassing a wide variety of approaches and critical discourses, the book smartly divides the discussions into three sections: (1) “Expanding Documentary,” investigating new ways of producing, engaging audiences and politicizing documentary content; (2) “Production Practices,” showcasing how effective documentary approaches such as participatory and collaborative filmmaking are now growing in practice and impact through the global reach afforded by the digital domain; and (3) “Inter/Action: Rethinking Documentary Engagement,” a section that explores how the audience is joining the filmmaker as a producer and distributor and no longer just as a mere viewer and what ethical challenges arise from this collaboration. The multilinear documentary is among the more fascinating documentary ecologies emerging today and is examined at some length in this book. Matt Soar, one of the developers of the Korsakow system, a popular database documentary production software, contributes a detailed chapter entitled “Making (with) the Korsakow System.” Referring to the multilinear creation program as “second-wave software” (156), Soar explains that Korsakow – and the multilinear documentary film projects that it enables – have three different kinds of editing: the first is the regular kind of editing we see in traditional filmmaking; the second, Soar refers to as “algorithmic editing” in which individual film units (“smallest narrative units” or SNUs) are assembled in a unique symbiotic manner that allows the viewer to choose which fragment to view at any given time; the third involves the viewer in this editing process as they are provided with the responsibility of selecting which SNU to view. Another contributor to this book and on this topic is Kursakow filmmaker and teacher, Adrian Miles. He provides an interesting perspective on the SNUs, treating all film units as equal in digital documentary content – even those that are traditionally left “on the cutting room floor” (or the digital equivalent term, the “trim bin”). These elements are considered fragments of the database and as such, Miles argues that an editor “no longer decides on a specific, and a single connection between one shot and the next” (71). The viewer now assumes the task of assemblage and does so with all available SNUs, including those in the “trim bin,” now defined as a database. The implicit narrative of this book is that these new and emerging theories, technologies and ecologies would not be possible without the digital media technologies. Digital media have enabled unique affordances that have provided enhanced advancements in production, engagement and dissemination of the documentary film. Kate Nash explores this phenomenon in her essay, “Clicking on the World: Documentary Representation and Interactivity.” Nash argues that viewers of digital documentary films are no longer mere “spectators” (50). The range of practices expected of the digital documentary film viewer are now described as “forms of interaction” (50) – a definition which makes no sense in the traditional cinema experience of passive film screening. The theory and praxis in this new world of documentary production has shortened the distance between filmmaker and audience. In some cases, production and engagement are simultaneous and may even provide the opportunity for maker and user to communicate directly with each other in streaming chat rooms or comments pages. This kind of interactivity is defined by Nash as a “multidimensional phenomenon in which the action of users, documentary makers, subjects and technical systems together constitute a dynamic ecosystem” (51). A documentary story in this environment undoubtedly achieves unprecedented levels of mutual engagement; but does this result in enhanced audience influence for activist and social issue projects? Alexandra Juhasz, in her essay, “Ceding the Activist Documentary,” believes the possibility exists: “A growing body of digital media studies … attests to the empowering potentials for the Internet-based documentary” (39). She posits that the “greatest challenge for the activist digital documentary will prove to be how to generate political practices from [the documentary filmmaker’s] artfully placed and digitally linked evidence” (44). The book also examines this new documentary ecology in Sandra Gaudenzi’s essay, “Strategies of Participation: The Who, What and When of Collaborative Documentaries.” Referring to the online documentary audience as prosumers, she argues that the new documentary film viewer is not merely content to watch a documentary, but expects to assist in the making of it. This raises certain ethical questions surrounding intellectual property ownership and the journalistic integrity of content. When it comes to collaborations, Gaudenzi argues that while they are successful at visualizing “the multiple through a single uniform interface, they end up standardizing it” (138). This may apply to projects like One Day on Earth, which she uses as an example, showcasing random fragments of a day in the life of people around the world; projects with more discrete, unified, and consistent objects such as climate research, however, provide a database of factual information specifically required by a policy-making body. It is evidently possible to affect social change on a political level using the accessible digital tools now available to the documentary filmmaker within the “New Documentary Ecologies” that this book explores. New and emerging digital environments for documentary production promise to enrich the genre’s implicit goal of impacting on progressive social change. Mark Terry, PhD, teaches at York University and Ryerson University in Toronto. His areas of interest are documentary film theory, polar studies, and climate change policy.